Use tools and data resources described here to facilitate planning and analysis. See more below about using these resources. This section is updated frequently with topics relating to Arkansas demographic-economic characteristics and trends. See more about examining state, metro and county demographic-economic characteristics and trends. 1. Visual pattern analysis using GIS resources ... examine Arkansas neighborhood/market area demographic-economic patterns. Develop collaborative insights; zoom-in to areas of interest; create alternative views; add your own data. 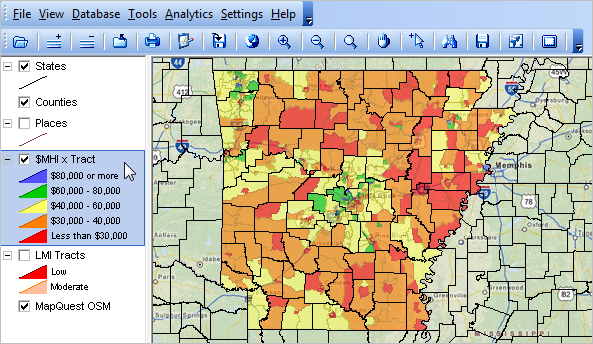 .. install Arkansas by neighborhood GIS project; create custom maps. The population of Arkansas changed from 2,921,737 in 2010 to 3,004,279 in 2017, a change of 82,542 (2.83%). The change reflects 268,765 births and 212,448 deaths (56,317 natural increase) with 4,773 domestic migration and 21,060 international migration (25,833 net migration). -- create Arkansas all places ACS 2016 5 year estimates dataset -- -- about this feature.